If you have stumbled here by accident and do not have a clue what this is about, please read ‘What is 100WCGU?’. There are no guarantees that it will still be clear so do contact me below if you are unsure. Click here to enter your link. It will take you to another page but I will transfer them here as soon as possible. It took until Saturday (9 June) for this one to ‘click.’ It’s rare that everything falls into place for me on the evening when the challenge goes live! Interesting that not so many people have posted early on, admittedly it took me longer than usual! 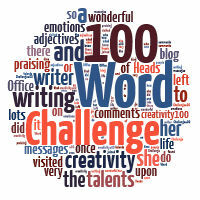 Pingback: 100-Word Challenge: Hero Time | Even More BonusParts! As long as it rhymes everything else is unimportant, right? That’s how poetry works, right? I hate writing poetry. I only took part this week because I wanted to maintain my (so far) 100% participation record in the 100WC. Bah humbug. It doesn’t even have to rhyme!! You can do it!! Aaaah! You have placed a toughie on my this week, Julia. The last time I read a poem or wrote one was in one of my English courses. Eeeek! Deep breathing now! That’s right – in, out, in, out! There – that’s better isn’t it! I was going to come back this week but if it’s poetry week I might vanish again hehe. Okay will try it hopefully. Excellent! Remember, it doesn’t have to rhyme! So a poem is basically prose cut into short line and each line beginning with a capital letter (or not) – right? Oh my goodness! What a great challenge!!! I’m on the case! That’s no excuse not to have a go. Come on! You are strangely irresistible! The hurdles you persuade me to leap!! Reblogged this on Prosing On.